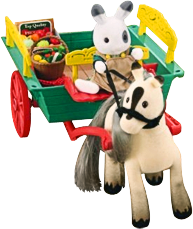 Here comes Bob Blackberry and his trusty steed Blacksocks with their wonderful selection of fruit & vegetables fresh from the farm. On arrival Bob feeds and waters Blacksocks for all his hard workgetting them to market before setting up his stall. Once set up, Bob draws a crowd of customers withhis call of "Come on Ladies, fresh fruit and veg from the farm this morning, you can't get better"!